In the stark, grandiose landscapes of Northern New Mexico, it is easy to see the human element as small. Significant to be sure, but comparatively outweighed by the beauty and immensity that radiates so gracefully and quietly from big-sky vistas. Compared to the dramatic landscape, the human presence is more akin to interference, a disruption of the Wild West. The byproducts of this human disruption therefore mar the land more visibly and more violently against the backdrop of high desert and mountain. In Art for a Silent Planet: Blaustein, Elder and Long at the Harwood Art Museum in Taos, three artists living and working in Northern New Mexico incorporate the aesthetics of the changing landscape into their work, each submitting, according to the museum’s statement, a “silent, dispassionate plea for environmental introspection.” Through painting, photography, and sculpture, each artist takes the easily forgotten castoffs and the unintended byproducts of human consumption of natural resources and turns them into artifacts and relics, conceptualizations of the changing landscape. Nina Elder’s paintings and drawings of piles of industrial trash and mine tailings (the materials left after mining extraction) are re-thinkings of the traditional landscape artwork. Piles of rubble in contrasting, hard-edged blocks of color are flattened with a pop art-like finish. Without the assistance of perspective, the massive mounds turn into looming, impenetrable walls, pressed to the edges of the picture plane. In these close-ups, the surrounding landscape is out of sight. The piles dominate and become landscapes of their own. In Tailings, Molly Kathleen Mine, Cripple Creek, CO (2013), Elder has allowed a glimpse of forested land to peek through in the distance. Its minute presence only serves to supersize the mound, as debris thrusts up through the sky, mysterious and undifferentiated. Unaffected by weather, atmosphere and light, these heaps remain stoic and unwavering. Photographer Jonathan Blaustein photographs common objects in exacting perspectives and creates stark compositions that cast the mundane as aesthetically compelling. 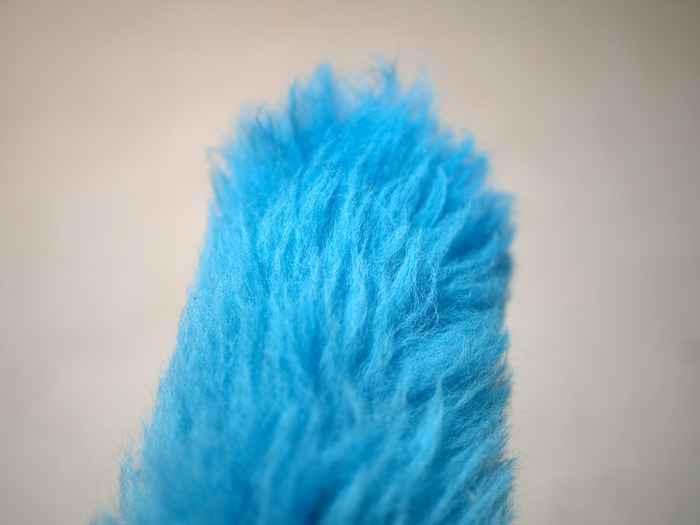 The objects, from acid pink plastic bag to electric blue microfiber dusting wand, are reminders of the growing distance between the present way of life and the natural world from which we take and consume. Through Blaustein’s lens, food dye-laden rock candy becomes an object of wonder, a specimen of curious origin and even more curious use. Reading the title, People Feed This to Their Children (2013-14), one wonders how such a thing came to be. Cow Farts Cause Global Warming (2008-2013), expands on this distance from lived life and the land, considering a lack of direct relationships with natural resources. Part of the Value of a Dollar series, the work consists of four images of beef product. Though in different states, each portion is valued at one dollar: a cut of marbled meat, a lackluster cheeseburger, three pink and pasty cylinders, and a portion of cooked ground beef. The visual comparison of these commodities is turned into a meditation on the present human relationship to sustenance. Though that relationship is no less vital, it has been obscured and distorted to a degree of absurdity. Debbie Long works with materials that harness and manipulate light. In Tow Package/Yellow (2013), a small, curtained booth is studded with amber-yellow glass sculptures glowing from within, illuminated by exterior lights. The glass pieces are casts of debris the artist finds in the high desert: hood ornaments, Bic lighters, trailer hitches. In their glittering translucence, the glass pieces appear like organic growths of crystals and stalactites—slowly encroaching on and morphing the space. Or, perhaps the growths are more akin to a fungus, car parts taking on a life of their own. Either way, these man-made parts are reanimated and given free-reign over the walls. 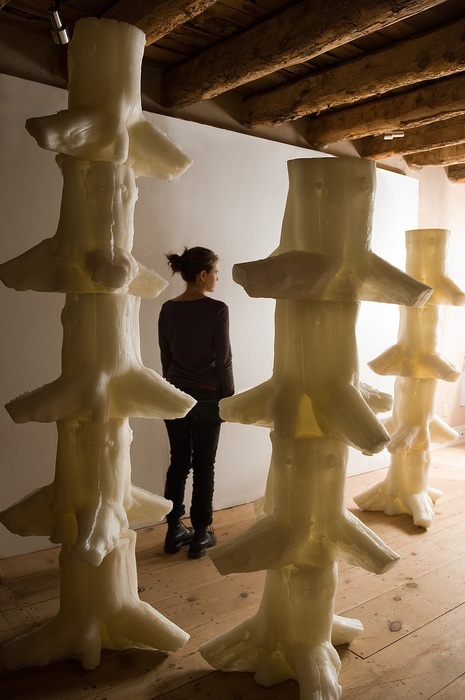 The opposite process has taken place in Tree Stump Trees (2013), in which the organic forms of trees have been cast in wax and stripped of their vitality. The central gallery space is a forest of luminous wax stumps, colorless and phony. Deliberately bland, though not without humor, the trees seem to suggest: don’t worry, when we run out of real trees, we can mass produce these ones. Taken together, the installation explores the disruption of the landscape, the dissociation from the effects of that disruption, and a repurposing of the resulting byproducts. Though a seemingly bleak impression, the exhibition succeeds in highlighting nuanced perceptions of the dangers of the shifting landscape, and reflects a vibrant wish for a collective rethinking of our relationship with the land.